‘SunnyMoney’ Solar Charging Stations are transforming the lives of many of our patients in Malawi, giving them a chance to build a hopeful future. We have been using solar charging stations as an income-generating opportunity since 2014 and, since 2017, have partnered with Sunny Money (SolarAid UK’s social enterprise project) and FINCOOP to provide patients living in rural communities with a portable solar-powered charging kit. The Sunny Money kit comes with two unbreakable lightbulbs and, crucially, is also a vital income-generating opportunity. It comes with a adapter that has the ability to charge 10 mobile phones at a time, thereby enabling our patients to charge a fee for this service. Whilst mobile phones are becoming ever more prevalent in Africa, the charging infrastructure to support them is limited, so this service is vital for many people in communities. Malawi has over 15million without access to electricity. 75% live on or below the poverty line of $1.25 per household a month. FFF aim is to provide hundreds of solar kits to our patients each year, which will enable our healed women and girls to return home with affordable, clean, sustainable energy and a means to earn money through entrepreneurial ventures. Fryness is a patient ambassador in Malawi who received a solar charging kit in March 2017. She was one of the first candidates to receive a "Sunny Money" solar kit. Since receiving the solar kit Fryness has been able to light her house. This is the first time Fryness has lived in the light since she was born. The solar station also provides security in her home as thieves are afraid to approach her home due to the lights that are visable from a distance. 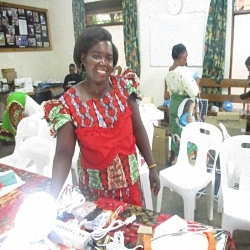 She also earns money by charging mobile phones for others in her community and has made MK 7,500 (Malawi Kwatcha). Fryness hopes to save some of this money for her dream, which is to expand her farm by purchasing more land that will enable her to reap more harvest. She will then be able to sell the harvest and use this extra money to build a house for her family. Fryness is very grateful to have a solar kit. Her life has completely changed compared to her previous life. She never thought her life would be this good. She wishes for the project to continue so that other women in a similar situation can also benefit.